Kitchen Language: What is Amuse Bouche? From commonplace colloquialisms to obscure obsessions, brush up on your food terminology with us as we demystify culinary lingo in our Kitchen Language column. The term ‘amuse bouche’ is French for “mouth amuser”—think complementary little bites that chefs send to diners at the start of their meal. Amuse bouches can range from just one dish to as many as six or seven. The advantages of having these morsels are plenty: guests get pampered while experiencing the chef’s culinary vocabulary as much as the kitchens get a gastronomic sketch pad to play with techniques and flavors without feeling obliged to include the items in the fixed menu. The amuse bouche came into being around the time when French chefs developed ‘nouvelle cuisine’–the era where fine dining fare evolved into smaller, daintier dishes. The focus was on tasting the natural flavors of fresh produce while moving away from the traditional heavy sauces and marinades. It was also a time when chefs started being competitive, striving to outdo each other in creativity. What started from something as simple as just olives on a small plate soon turned into minuscule bites that showcased several elements and techniques in just a single serving. But that didn’t mean it was always around. "Amuses became unfashionable during the late '80s, but recently they've returned to fashion," says chef Jean Joho of one-MICHELIN-starred restaurant Everest to USA Today. "I'm a fan of serving them because it's a way of being creative." Today, the amuse bouches at fine dining restaurants can range from slightly more traditional broths or mousses served in espresso cups, to creative plays that deploy all manner of props, like placing pretty morsels on foraged mosses, as seen in Nordic restaurants like Geranium and Maaemo, or olive ice cream globules hanging off an actual miniature olive tree at El Celler de Can Roca in Spain. 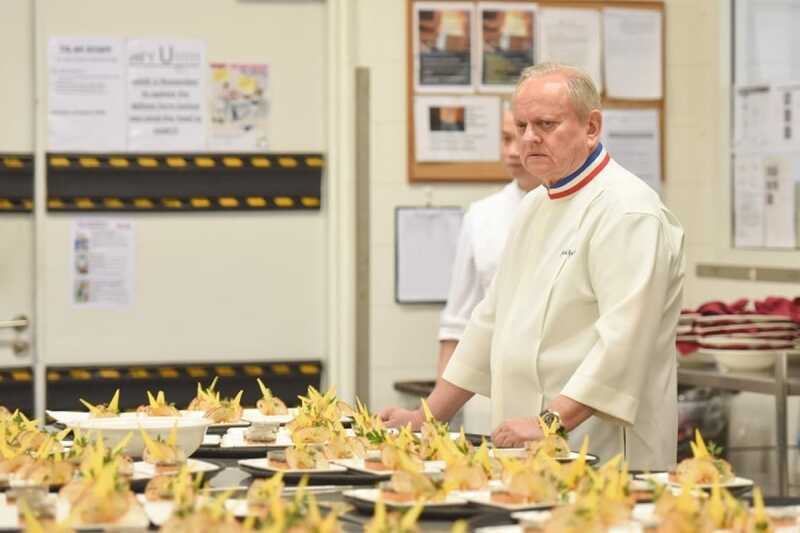 Chef Joel Robuchon scans through rows of amuse bouche. While chefs use it as an opportunity to showcase their culinary finesse, serving up such bold flavors early into the meal has its merits: it can increase the appetite while promoting feelings of satiety–especially if the chef whips up nuggets packed with umami goodness. One study done by The American Journal of Clinical Nutrition showed that it induced the production of saliva—perfect for what’s soon to follow. Azimin Saini was formerly the Digital Features Editor for the MICHELIN Guide. The massive foodie enjoys cooking in his free time and relishes the silence of hidden eateries around his residing city of Singapore. Sharpen your knife skills with this handy guide to cutting terms like julienne, chiffonade and brunoise. A look at the technique used to reduce liquids without heat. Hilton Singapore’s new executive pastry chef Cindy Khoo demonstrates this deceptively simple technique that elevates any plate to fine-dining standard.